This new book volume (in Spanish) is edited by our Komplitt committee member Christian Claesson. Subjectivity refers to that which differentiates us from others, but at the same time to what inserts us into the community and leads us to share desires and interests with others. 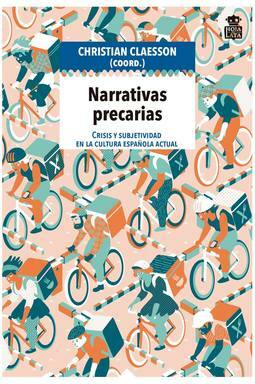 Precarious Narratives evaluates the impact of the crisis on subjectivity and studies, from political theory to cultural criticism, the formation of new subjects, fragmented and decentered, which saw their ties with their community break down. The crisis produced a precarious subject. This new subject produced a series of stories —novels, films, theater plays— that narrate the new ways and conditions of living precariousness. But, in turn, narrative itself became precarious. The precarious subjects, incapable of giving narrative continuity to their story, narrate their life in a cracked, interrupted, broken way. A broken life generated a broken narrative. Through a common but polyphonic voice, these precarious narratives track the potential of political fiction to destabilize the dominant thought structures that may lead to an individualistic retreat in the face of crisis. The outcome of crisis cannot be individual, but must be collectively and radically political. In the cultural production of post-crisis Spain and in its precarious way of narrating, it may be possible to find an answer that allows us to think collectively about society and ourselves.